Granola4 cups oats 1 1/2 cups sliced almonds 1/2 cup brown sugar pinch salt pinch cinnamon 1/4 cup honey 1/4 cup oil 2 tsp vanilla optional: raisins, dried cranberries/cherries/blueberries/apple Oven to 300 degrees. In large bowl mix first five ingredients. In a small bowl, blend honey, oil and vanilla. Pour over dry ingredients and stir to blend. Spread in big pan and place in oven for 40 minutes. Stir occasionally. Keeps for a week sealed at room temp, or frozen up to 3 months. Note: I had the distinct pleasure of being one of California Raisin Marketing Board's select Blog Ambassadors this year. 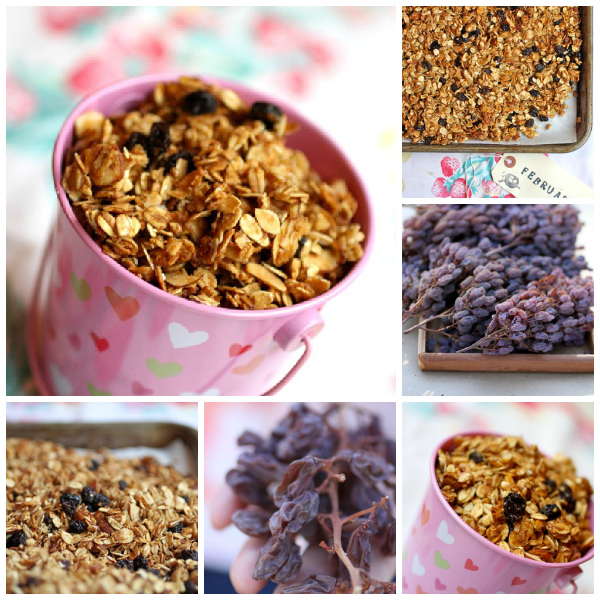 I have been inserting raisins into recipes for the past few months---with great results. I have a new found affection for raisins, you could say (with Valentine's Day coming and so forth): I heart raisins. And my family hearts this granola. My other raisin recipes: raisin pumpkin bread, raisin-studded blue cheese coleslaw, rum raisin cookies and 5 raisins dessert recipes.